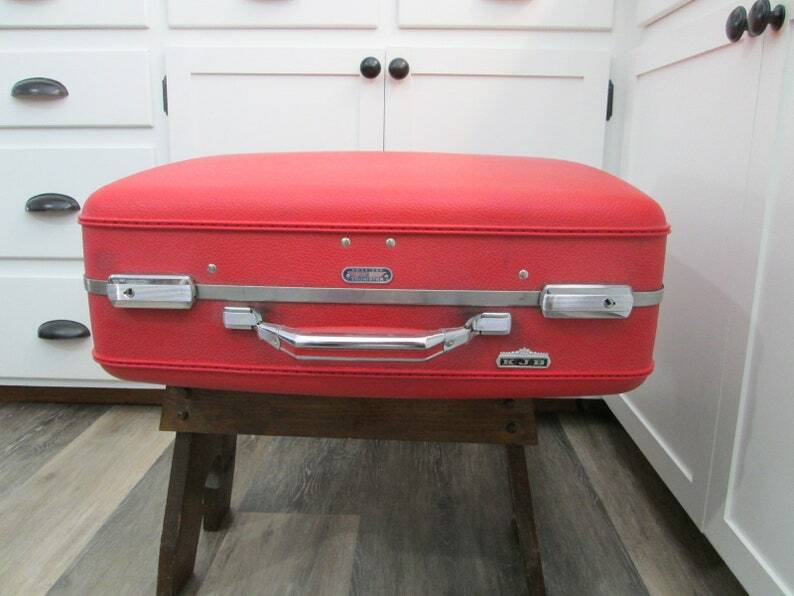 Vintage American Tourister suitcase with keys in a fabulous RED on the outside and a very feminine silky quilted flowery on the inside. There are initials on the front KJB. There are a few scrapes and marks on the outside. The inside of the suitcase has 4 red hangers, a drop curtain, detachable pouches and satin ties. This is very clean inside. This set is in very good vintage condition. This measures approximately 21 1/2 by 19 1/2 by 7 1/2 inches. Please review all photos carefully, as they are part of the description. I do my best to describe any imperfections or damage, but like all vintage items, some wear is expected.